Vinodh Kumar is one of the top industry leaders when it comes to search, ranking and machine learning. 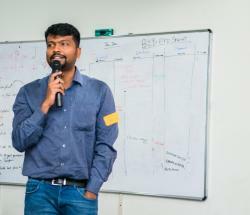 After securing All India Rank #1 in GATE Computer Science 1999 and earning his Masters in Computer Science from Indian Institute of Science, Vinodh went on to lead the Google News team building its core ranking algorithms and the Google Music / Apps Marketplace teams at Google. Subsequently, he was the CTO and Managing Director of Bloomreach where he built the e-commerce search engine platforms at Bloomreach. Now as CTO of Belong.co, he is applying his strong technology and machine learning experience to something he is truly passionate about - helping people find where they belong in their careers.